She shook her tiny toddler finger in my face and scowled. "Stop," she commanded with all the authority she could muster. My mouth fell open. How had she learned to be so bossy, so demanding? The truth is that I shouldn't have been the least surprised. After three children, I've clearly seen how early and naturally sin manifests itself. As my husband said while holding each of our newborn babies for the first time, "What a cute little sinner". In order to correctly teach the doctrine of sin to our kids, we must reinforce the fact that we are inherently or naturally sinners from the time of our conception. It is that original sin that then reveals itself in wrong behaviors and attitudes. In other words, we fail to meet God's perfect standards before we have officially committed our first misdeed. Just like when we teach about the eternal punishment for sin, it's this bad news that makes the good news so wonderful! Jesus took the separation and consequences of our evil choices on himself to offer us a way out of the horrible mess we all find ourselves in from birth. It can be intimidating to explain these concepts to our kids and we fear that we might explain it incorrectly or somehow confuse their little minds. That's why it can be so helpful to have resources like the brand new book, Blotch by Andy Addis. 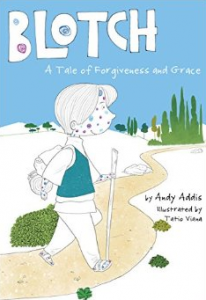 This 5-chapter parable, follows the story of Blotch who is a boy who lives in a kingdom where everyone is born with one mark on their skin. Each time they act or think wrongly, a new blotch appears. He is determined to find out a way to get rid of these embarrassing spots, so he sets out on a journey. Along the way, he meets different people dealing with this blotch problem in different ways (hiding them, ignoring them, etc...). He finally finds the answer to this pressing dilemma when he meets a kind stranger who is willing to offer himself in a sacrificial way. I won't spoil the end for you, but I will say that this book explained the gospel in a gentle, yet clear way. It's illustrations perfectly fit the story and my boys couldn't wait for me to turn the page. It also includes notes for parents and a discussion guide to accompany each chapter. It worked well for us during our homeschool Bible time, but it would also be a great tool for family worship in the evenings as well.